New to Kavio! is their Women's short sleeve basic V neck and crew neck t shirt, made of cotton/poly Slub Jersey. This Slub Jersey is a soft and comfortable fabrication with a stretchy, striated cotton/poly knit that gives these tees a streaky look for an edgy appeal versus ordinary everyday cotton shirts. 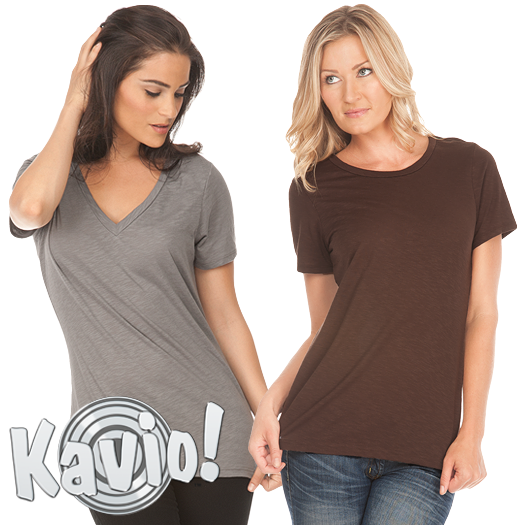 Ultra-comfy and soft this Women's Slub T Shirt's is a must-have staple for any season. Available in 10 popular colors in Women's sizes S-2XL.